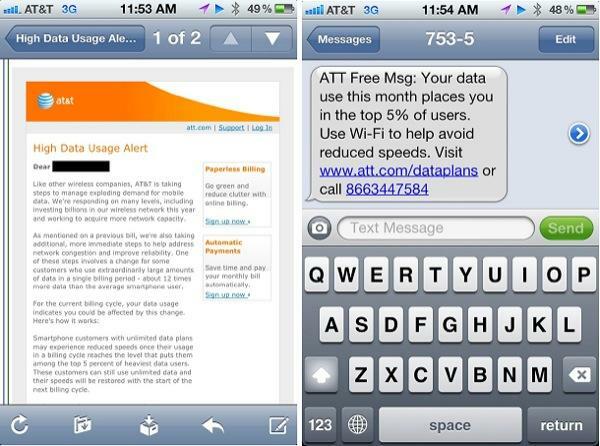 In a California court ruling on Friday, an AT&T customer who saw a reduction in his iPhone's download speed due to high usage was awarded $850 on claims that the telecom's throttling measures are unfair to consumers. Pro-tem Judge Russell Nadel handed down the decision in favor of Matt Spaccarelli in Ventura Superior Court in Simi Vally, bringing an end to the small claims case that was filed in January which asserted that AT&T unfairly reduces unlimited data plan users' bandwidth speeds, reports the Associated Press. The ruling could affect the roughly 17 million subscribers, or a little under half of AT&T's smartphone customer base, who pay for a so-called unlimited data plan that was first introduced alongside the original iPhone. The nation's second-largest mobile carrier ended its all-you-can-eat plan in 2010, however the company allowed existing users to keep their unlimited service on the condition that the privilege would end if they ever opted to go with a tiered contract. In other words, an unlimited subscriber cannot return to the endless data plan if ever they choose one of AT&T's tiered options. As smartphones grew in popularity after the launch of Apple's handset and smartphones running Google's Android OS, data bandwidth became increasingly scarce. In an attempt to stem the swelling tide of data users, AT&T and other telecoms made the decision to throttle the download speeds of the top five percent of "heavy users." In Spaccarelli's case, speed was reduced after about 1.5 GB to 2 GB of data usage during a particular billing cycle, which is far less than the identically priced 3 GB tiered plan. Currently, unlimited access to AT&T's network costs $30 per month for grandfathered-in customers, while tiered plans run $20, $30 and $50 per month for 300 MB, 3 GB and 5 GB, respectively. According to an in-court argument by AT&T area sales manager Peter Hartlove, the carrier has the right to modify or cancel a contract if data usage is so high that it bogs down the network. The agreement also claims that if a plaintiff wins an arbitration case, the minimum award from AT&T would be $10,000. Although Spaccarrelli asked for the same compensation, the small claims court judge only awarded him for $85 for each of the remaining 10 months of his contract. AT&T's attempt to clear data congestion has been vague since its introduction in 2011, as the system is based on a sliding scale and not a set bandwidth cap. User also won't know if they are part of the top five percent until a warning message is received, and by that point they only have a few days of regular usage before seeing a reduction of speed.